I have only been meaning to post about the Pose Fair since it began and I have been there more than a few times to look around. I had even been added to the bloggers list which I had forgotten I’d applied for. Anyway, it was nice to browse before he fair officially opened, and I’d like to thank all the pose creators involved for their efforts. Without great pose makers, blogging and photography wouldn’t be nearly as enjoyable! I just wanted to highlight a set I thought was super cute, as well as a pose I used from another maker just because I love how each pose by this creator is always so expressive and shows some drama in the body positioning. Baffle! has put together a nice little artist’s set complete with five poses, four paint brush attachments, clothing and tattoo layers with paint splatters, and an easel with paint splatter textures. I was so focused here on trying to be Picasso, I got paint all over my new top from Zaara! Oh well, the beauty about virtuality is you can clean up your messes with a click of the mouse. See…all clean! But then I dropped a brush on the floor and had to pick it up. I did it in a rather dramatic fashion with this pose by Di’s Opera. While the pose fair is at its end, you will find this set from Baffle! and the pose from Di’s Opera at their stores when the fair is over. Items in italics and *** note promo copies. I was really feeling this corduroy mini skirt from League at the most recent Fifty Linden Friday. It’s a cute and casual little number. Newly released also were these camisoles also by League. There were a number of rich neutrals and darker tones, but since I really do not have a lot of browns and tans in my inventory, I decided to buy the cami in cream, and the skirt in brown. I bought the skirt in cream as well, but felt it was too monochromatic. The hair is a new release from Elikatira. A mid-length, casual style with one strand pulled back on the side secured by a color change bobby pin. The jewelry is again from the past sale at Je Suis! My location of choice here was at the desert themed sim of Tableau. It really is an excellently designed location perfect for some hot weather shots. I needed some warmth (albeit warmth shown in a virtual sim). Hello SL Fashion Public! Unfortunately I have let my blog get a bit…silent–you know, the whole busy with other things line. I’ll spare the explanations and get right to the fashion related commentary. This ensemble contains a little bit of old and sparkly, and some new and lovely. Je Suis had an amazingly awesome sale recently, and I honestly could not hold myself back from buying nearly everything I was still yearning after. The African jewelry set is an edgy conglomeration of beads and metal with great texturing and detail. Quality is what you will find at Je Suis, and it is found in abundance. I am also wearing fingernails from Je Suis, which I generally never do (sometimes I’m plain lazy with accessorizing), but these black, perfectly shaped nails with optional ring and color options were a perfect addition. The other new item is this FrouFrou skirt in Onyx by The Secret Store that was an item being sold at the Pacific Crisis Fundraiser to benefit Japan. I haven’t been to many of the fundraising events lately since I have not been in SL as much as before, but having helped with other SL fundraising events, I want to stress how really helpful these events can truly be. Little things do add up, and the fact that we can spread awareness and raise donations in a virtual world that will aid real organizations is a mind blowing thing. Just a little promo…Another Fundraiser, is an additional event where all proceeds are donated to The Red Cross. All skins and makeups there are only 50L. See the flickr group here. A nice finish to the outfit were these booties by Gos I had picked up at a Disco Deals event awhile back. They added a little more shiny funk while complimenting this old top that I have had forever. You might say I love this shirt for its glitter factor! A look that is both a little funky and frilly, this top and leggings by Peqe at the Chic Limited event are too cute! I just wanted to blog it quickly with one of the new hair styles from Lelutka. See credits below! There have been a lot of great shopping sales and events as of late, and I waited and waited for the Chic Limited event to finally open so I could grab some of these beautiful shoes from G-Field! The style and color perfectly complimented the shape of this dress I bought from The Secret Store at the Euphoria End of Season Sale. 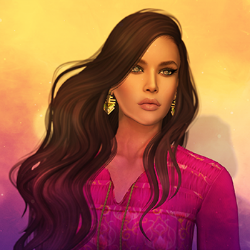 I strongly recommend wandering over to the Euphoria Sim and joining the group to keep in the loop regarding updates on future sales. Many fantastic designers have shops there, and any time you make a purchase from any shop, you earn points for discounts. It is definitely a slick rewards system, and it helps promote our favorite activity: SHOPPING! 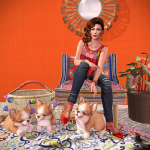 This delicately constructed necklace was the most recent Fifty Linden Friday item from Miel. It looks incredibly realistic and dimensional and added the last bit of flair I wanted in my look. *Please see the sidebar of my blog for shop slurls!